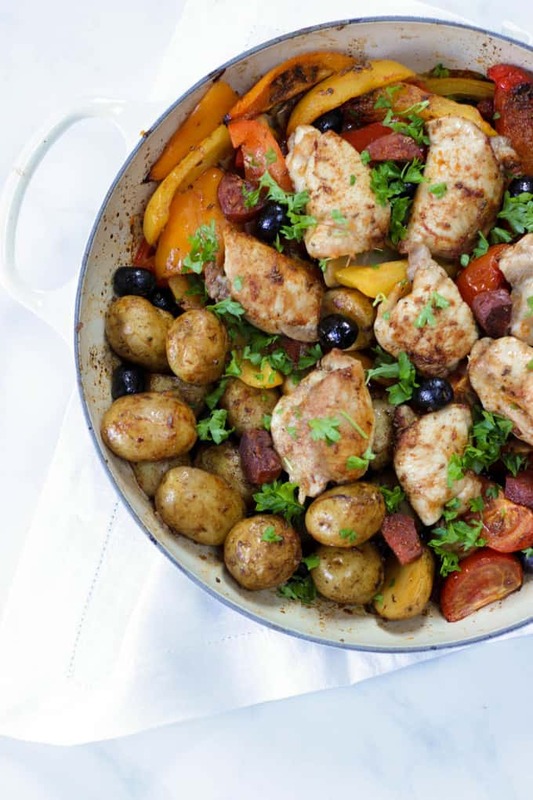 Spanish Chicken One Pot – This quick and simple mid week meal really delivers on flavour and time, and only one pan to wash up! The perfect family dinner. Where has the summer gone? Any ideas? We were away last week and have returned home to rain rain rain and grey skies. Please tell me that our week of summer isn’t over?! Of all the foodie seasons, I love the taste of summer. It becomes law in my mind that as many meals as possible must be cooked on the barbecue, that every lunch should be a picnic and that we must eat as much as possible of the seasonal goodies while they are at their best. I’ve gorged myself on asparagus during May (and tried to convince the children – they still aren’t sure) and now it’s time for one of my favourites, new potatoes. If you’ve never discovered the sheer joy of a new potato, trust me, you need them in your life. These seasonal beauts take the humble spud to something special. Everyone hankers after the Jersey Royal, but this year I discovered Cornish new potatoes when Tesco sent me some to try. First try and that was it, right there in the pan, a taste of summer to me, dripping with butter and mint. Cornish new potatoes are the first UK mainland crop of the year, making their way to Tesco stores from middle of June until end of July. Cornish potatoes are inexpensive, fresh, tasty, naturally fat free and suit most diets from vegan to gluten free. They are also super convenient, their fluffy skins only need a wash and they are ready to go. 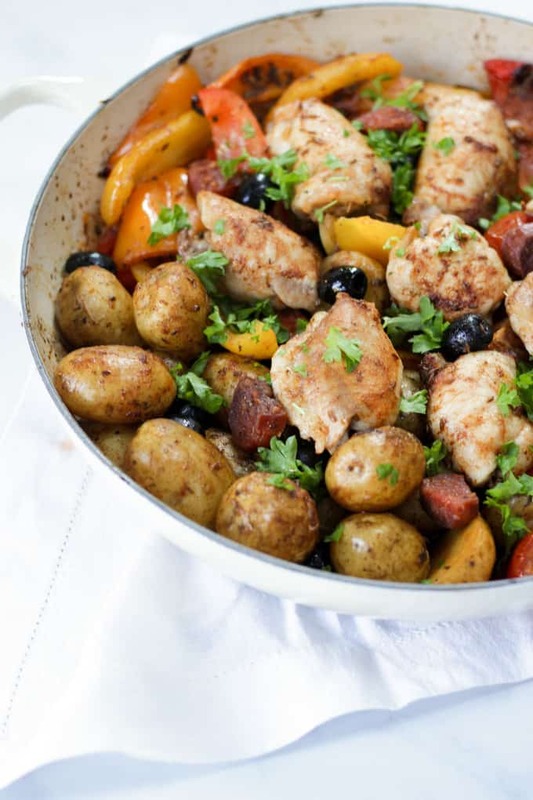 I decided to pair the potatoes with some other tastes of summer, some of my favourite Spanish flavours. 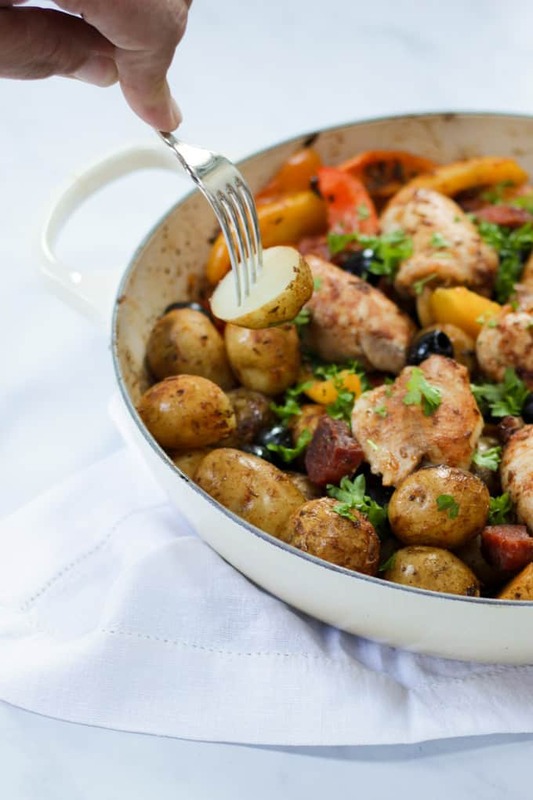 This dish is super easy, colourful, tasty, hardly any washing up and suits these delicious potatoes perfectly. Also excellent for a taste of sunshine when we are in the midst of a rainy British summer! 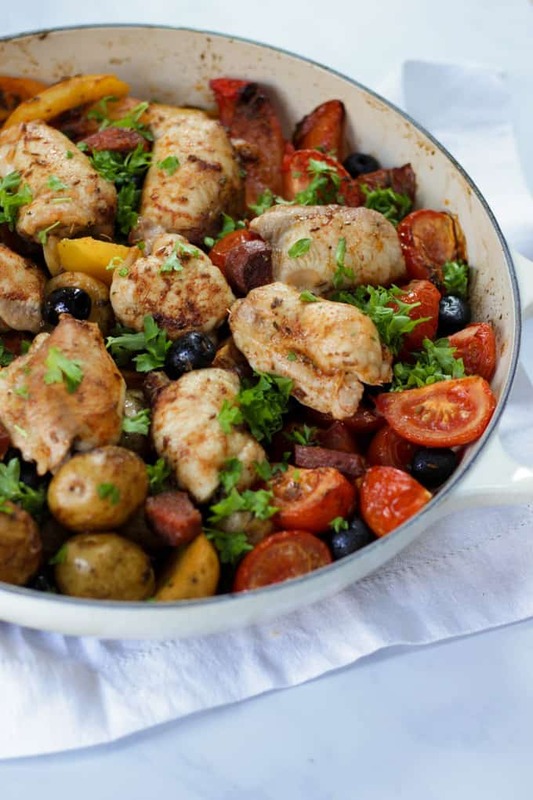 For other one pan ideas, try my Chicken and Asparagus Traybake. 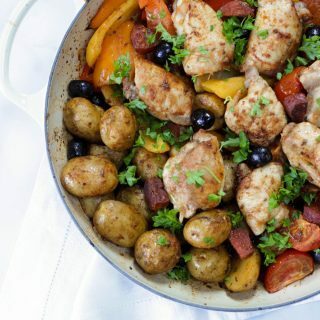 Spanish Chicken One Pot - This quick and simple mid week meal really delivers on flavour and time, and only one pan to wash up! The perfect family dinner. Parsley to garnish if you have some. Mix the olive oil, sea salt, freshly ground pepper, cumin seeds, oregano, smoked paprika and garlic together in a small bowl. 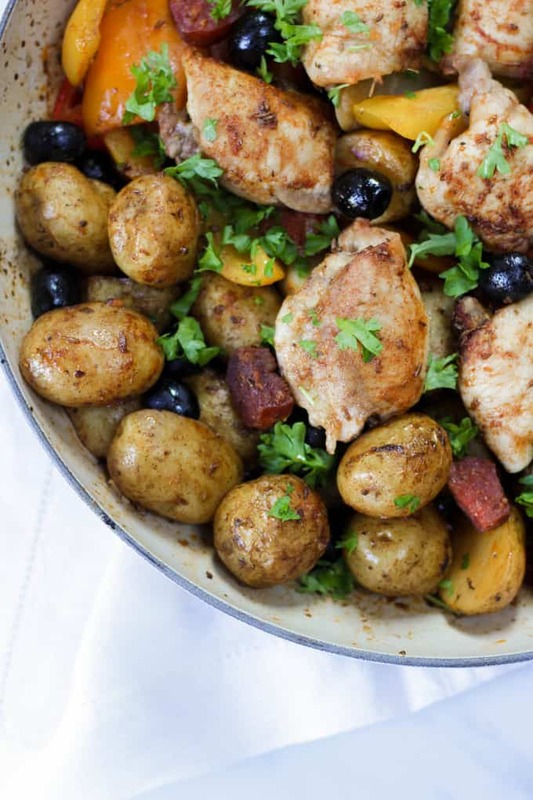 Put all other ingredients onto a large baking sheet (or two if they are too crowded). Pour over the olive oil mixture and thoroughly coat everything. I find it best to use clean hands to do this. Bake in the oven for about 45 minutes or until the chicken is cooked through. Garnish with parsley if you have some. Oh Sarah this looks amazing! 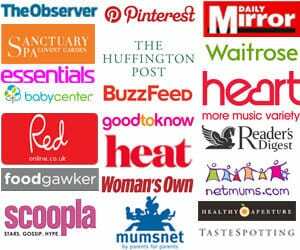 My family LOVE the recipes of yours I’ve tried, so thank you!